First ticket of Grama Shakthi instant lottery, which was introduced newly to the market by Development Lotteries Board under Grama Shakthi Janatha movement, was presented yesterday (29.01.2019) to H.E. the President by Mr. Sena Suriyapperumaa, Chairman of DLB. DLB often introduce instant lotteries to the market to mark the launch of development projects of the Government and the main objective of such measure is to make the people of the country aware of these projects. 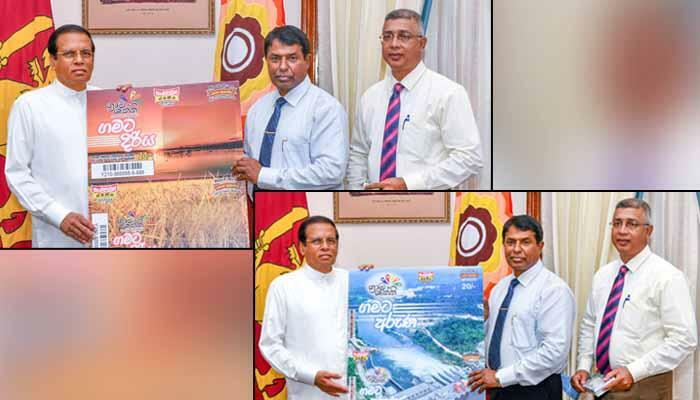 Previously two lotteries were introduced by DLB in the names of V2025 Gamata Saviya and Gamata Dinuma concurrently to Enterprises Sri Lanka 2018 programme. DLB states that it is expected to issue lotteries to the market for various projects launched connecting to Grama Shakthi movement in due course.